A challenge came when a friend of mine wanted to expand his guitar setup with an effect processor. This lead to a new problem. In some songs he needed to switch a preamp channel and change the effect at the same time. We came up with a solution, but it required some special electronics. His preamp is a H&K Tubeman. An analog tube preamp with three channels. The idea was to develop a midi interface that will be able to switch the channels. The switching is initialised by receiving a program change command from the effects unit. 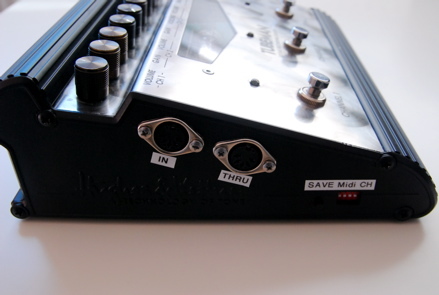 The midi interface can save for each program change command the desired preamp channel. The saved preamp channel is recalled when the program change is received again.